I reviewed how to play major scales on the guitar in my last post. You’ve learned those scales right? I’m still working on them – and I have been for years. I know them, but I can always improve. But as I said last time, scales may be useful, but are by themselves are boring. So today I’m going to talk about arpeggios. How arpeggios can be useful is more apparent – at least to me – than abstract scales. Arpeggios are simply the notes of a chord, played one at a time, in sequence, instead of strummed all at once. I’ve seen many definitions of arpeggios that say essentially the same thing, but if you’re just learning arpeggios, the important thing to learn is what are the notes that make up a chord – the formula for a chord. Just plucking each string in a chord you already know may technically count as an arpeggio, but you’d be missing an understanding of the notes. A good starting point to illustrate what an arpeggio is, is the major scale. The image on the right shows the E form (cagEd) or 6-2 form of a major scale. If the scale starts on the 3rd fret of the 6th string then this is a G major scale. The numbers in the gray and black circles are the scale degrees of the major scale. The black circles are the notes of a G major chord, played as a bar at the 3rd fret. As you can see and hopefully know, the “formula” for a major chord are the 1st, 3rd and 5th notes of the major scale with the same name. A “G major” chord has the notes G, B and D.
But a G major arpeggio would not be played by just strumming the 6th, 5th, 4th, 3rd, 2nd and 1st strings, one at a time. There are two useful G major arpeggios from this scale position. The first arpeggio, starts on the 6th string the same as the major scale. The first two measures show this above. There are two notes of the arpeggio on the 5th string – so strumming the strings one at a time isn’t possible. I’m showing these arpeggios both ascending and descending. The arpeggio on the high strings (the 3rd and 4th bars) could be played by just strumming the top 4 strings of the bar chord – but the finger positions are different because you are playing in the E form position starting with your 2nd finger on the 6th string or for the high strings, your 4th finger on the 4th string. Now that you’ve seen this, you should be able to go back to the previous post, Major Scale Positions for Guitar, and find all the major arpeggios for each of the 5 scale forms in the CAGED system. Remember, you’re looking for the notes for the 1, 3 and 5 scale degrees, played sequentially. (Easy) Find the Major Seventh (maj 7) arpeggios. The notes are within the major scale and are simply the 1, 3, 5 and 7 scale degrees. (More difficult than above) Find the dominant 7th arpeggios for each scale position. These are the notes in your common 7th cords such as G7 – this is different than the major 7th arpeggio. The dominant 7th is not a note that is part of the major scale. It is the flattened 7th. Thus the notes of this arpeggio are the scale degrees 1, 3, 5 and b7. Because the b7th note is not part of the major scale, you may have to stretch to reach this note for some of the CAGED positions. 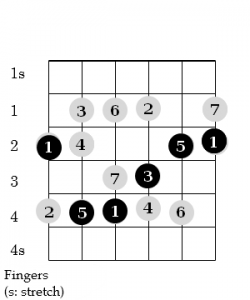 However, seventh chords are so common and useful, it would be good to learn this arpeggio. As to what will you do with these arpeggios once you’ve learned them, try taking a tune you know the chords to and substituting the major, major 7th and 7th arpeggios for those chords. This won’t necessarily make for the most exciting solo or fill, but it should help suggest how knowing these arpeggios can be useful.